Today is the last day of walking for me and Guylène. We have a 16k walk then need to catch a ride back to Le Puy at 2:30. The floor and the mattresses in the overflow room were very comfortable and I woke up well rested but in my normal morning language fog. My tummy was iffy yesterday and I pretty much lay down after arriving and consummed a lot of sparkling water. So I left a little before Guylène and Beate to walk around the town and take photos. The morning light was beautiful, and the town is beautiful also. There were lovely views back over the cemetary and the town as I once again climbed up and over a small col. The elevation map showed a slow steady decline from that point. Once again climbing up meant climbing out of trees to exposed plains, and fields of wild flowers. For the first time today there were whole fields of yellow gentian in bloom, up to this point they have been only large leaves with un opened flowers and their sturdy solitary forms remind me of cactus in the desert. After very stony pastures there are also starting to be fields of wheat again. I notice that the predominat color of the rocks used in buildings has switched from lava grays to beiges, browns and oranges. In no time the sun disappeared and I was battling headlong into the wind. I found myself walking faster to keep warm, and soon stopped to put on my polar vest, then my new blue rain jacket, with the hood over my hat and the zipper closed to my nose. Such a situation is not condusive to conversation with fellow walkers, though today I passed or was passed by more than on previous days. In the hamlet of L’Estrade a resident had set up a small shelter for pilgrims and walkers where you could get orange juice, coffee, tea and bisquits. There were several others paused there. It was a welcome relief from the wind and I took off my pack to wait for Beate and Guylène, but after a few minutes I was freezing, so up with the pack and off. Even though it grew darker it never actually started raining. And though my view was limited the countryside very pleasing, the walking comfortable, though the elevation map deceptive in that there were several small ascents over the course of the walk. Pretty soon the tiny town of St. Côme d’Olt came into view with its distinctive twisted steeple roof. A roadside marker informed us that this was one of the prettiest towns in France, and I was inclined to agree. There is a tiny newer town (newer being realtive, as most of it probably built fefore the US existed) surrounding an older area entered through one of the city ports. There was one last advertised restaurant before the final descent into St Côme and I thought of waiting there for B & G so we could walk into St Côme together, but the seating area was off the path overlooking a gorgeous little valley the other direction, and I was afraid I would miss them, so descended and wandered through the narrow, winding streets to the first city gate, and found a stone bench to sit on. Although sheltered it was still pretty cold, and after a while the sign of a salon de tea just down the street was eventually too much to resist. So I placed my backpack with it’s distinctve yellow flower by the bench where it couldn’t be missed by passing pilgrims, and dashed off to get a little pot of tea. I explained my situation and the owner agreed I could take my tea back to the bench. Luckily I caught sight of B & G just as my pot of tea and I were returning to the bench. We wanted to have a little lunch together, and the teashop had very appetising plates of salads and VEGETABLES so we made our selections and sat down. 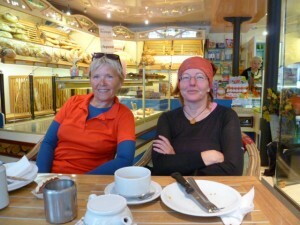 We were soon joined by Krista, a woman from Austria whom Beate had met. She is walking from Geneva to SJPDP, and it was reassuring to think that Beate would have someone to touch base with should she continue all of the way. Bruno, who I saw breifly at the epicerie in St Chely, and whom Guylene has spken with a couple of times also stopped by the table. He seems very nice. One hates to talk of auras, but his is calm and welcoming. He is also going on and I could see Guylène had also formed a favorable impression so introduced him to Beate with the information that they were both continuing. I regretted very much having to stop so soon. 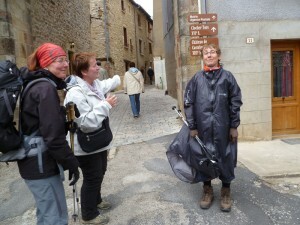 In no time the meal was over, it was time to catch our ride to Le Puy and say goodbye to Beate as she continued onto Espalion, where she will stop for the night. Even on the way to the bus we ran into more people to say good-bye to. Marie and Paul and Virginie. All met on day one. It is lovely to think of coming back to this town to restart walking in the future, but really, I want to go all the way to Fisterra!